Hiroki’s pieces have the feel of artifacts—of rare materials meeting rare craftsmanship but coming together in familiar forms, like jeans or parkas. They look like they were hand-sculpted after being dug out of the earth in some faraway desert. They have power…. He is fond of the word character, the way an object can express individuality, experience, life force. He has an aversion to things that are too perfect: “Because everything is made by machine, everything is perfect—it’s boring. It’s uncomfortable, almost. Even being in a new car, for me, I get carsick. Because it’s sealed perfectly, there’s no air movement. Just being in skyscrapers, for me, I feel like a little gecko put into a glass box or something, you know? I can’t breathe anymore.” He was trying, he realized, to make imperfect things you could breathe in. It was so interesting to me that this writer respects traditional handcrafts and unique design. But I so wished he had found someone to teach him to just make something, anything, for himself! I think that would do a better job of providing him the sense of character and community he was searching for. After reading that article, I looked at the Visvim website. I will never buy one of their $975 shirts, but I do appreciate their series of “Product Introspections” under the section called “Dissertations.” Each one has beautiful photographs, a little background information, and sometimes a video. Some of the topics are ramie fiber, indigo dyeing, and Japanese boru fabrics. I am always looking for good resources about sustainability. First, here is an article about personalized digital textile printing and its future in business. And then, this is the last week of the Scraps exhibition at the Cooper Hewitt museum, an exhibit about creating high value textiles from textile waste. But even though the exhibit will close, the online resources are incredible. Some of my favorite things there are the darning sampler from 1836, the infographic on where our textile waste ends up, and a beautiful textile collage by designer Reiko Sudo. 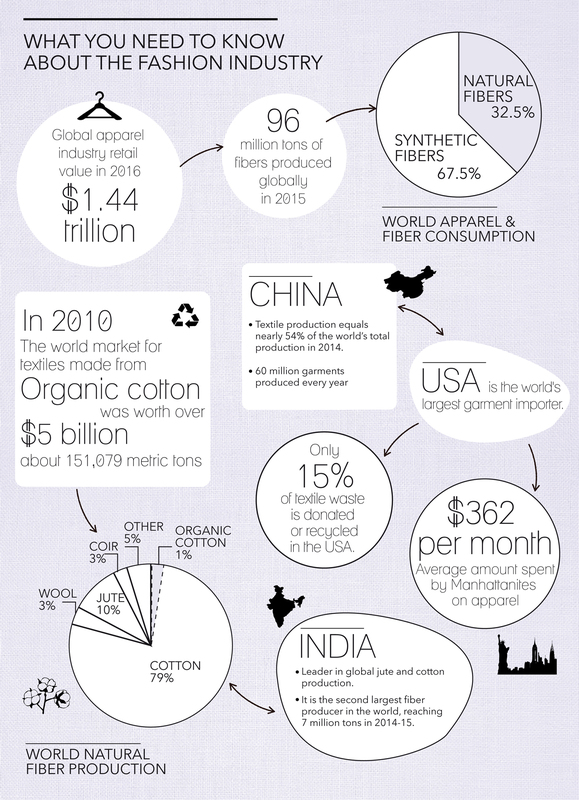 Here is one of the infographics. Diagram by Magali An Berthon, © Cooper Hewitt Smithsonian Design, 2016. Source. Back in September of 2016, I wrote about an exhibit in Philadelphia, on Vlisco wax cloth used in African fashions — Hyperallergic did an excellent story on that exhibit in November, and they showed all the pictures I couldn’t get permission to use. After you read that article, you will know everything I learned! 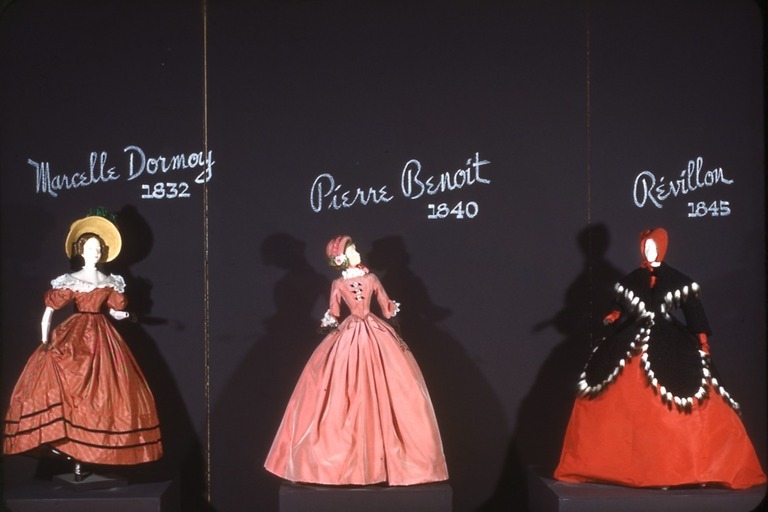 Even further back, in June of 2016, I wrote about the Théâtre de la Mode, when Paris designers created fashion dolls as a way to display their creativity even during the depths of WWII. I recently found out that a few years later, the designers once again collaborated to create a similar group of dolls. They were sent to the US as part of the French “Merci Train.” I had seen a room dedicated to a Merci Train display in the Arizona State Capitol, so I knew a little of the history. After the war, US citizens sent 700 boxcar loads of supplies to France and other countries that were experiencing post-war shortages. In gratitude, the French filled 49 boxcars with all kinds of heirloom treasures and handmade crafts, and sent them back to the US. To me it is heart-breaking to see the treasures that people parted with to show their gratitude. Two Centuries of French Fashion Elegance, September 26, 1949 through January 08, 1950 (Image: CTX_E1949i001.jpg Brooklyn Museum photograph, 1949. Source. 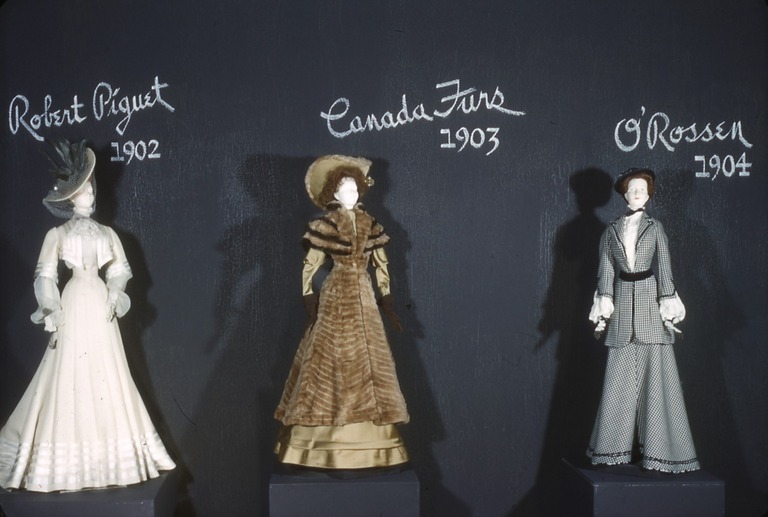 These dolls represented fashion history, and originally one was to go to each state. But then it was decided to keep them together and send them to the Brooklyn Museum. There was an exhibit in 1949 (and apparently never again), and photos from that exhibit can be seen here. They are beautiful dolls and it is really sad to me that they were exhibited against black matte board with only chalked labels, and even now, they are not in the online collection, only the photos of the original exhibit are. Two Centuries of French Fashion Elegance, September 26, 1949 through January 08, 1950 (Image: CTX_E1949i003.jpg Brooklyn Museum photograph, 1949). Source. Two Centuries of French Fashion Elegance, September 26, 1949 through January 08, 1950 (Image: CTX_E1949i013.jpg Brooklyn Museum photograph, 1949) Source. 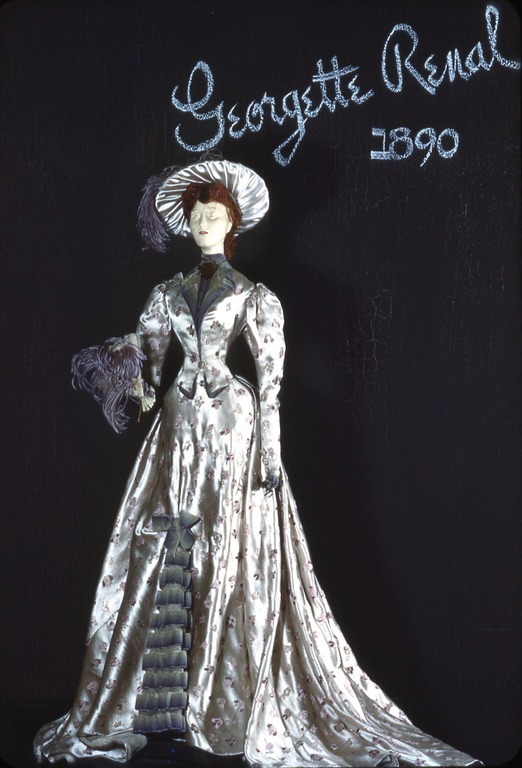 I wish there was more available online about these dolls, but I am happy to know that they were at least documented once. Crazy on many levels. We should rob banks to wear a $975 shirt ?? These people make me crazy!! I did read your piece re Théâtre de la Mode, and got the book from a friend and spent many hours pouring over it. So glad your Texas box car is intact. Interesting contents. Thanks. Thanks for “the rest of the story” in your follow-ups to past posts. I enjoyed learning about the Dutch wax prints, which look gorgeous on African women. And I can’t believe that doll fanciers haven’t latched onto those fashion dolls. They are much more interesting than those dolls valued in the thousands on the antiques road show. I found it hilarious that someone who didn’t know who he was decided to pay someone else to tell him. Well, hilarious and sad, really. If you have to BUY your identity, and you don’t even know what to buy, you must really not know who you are. Thanks for the updates. I’m going to look at the HA article now. I guess because he works for GQ he decided to turn it into a quest for expensive clothing, but I really felt like he would be happier making himself a scarf or something of his own. As far as the dolls, even if they can’t be displayed, I hope they were kept in good condition, and I hope they find their way online where they can benefit people!